Durango’s MJ Keo breaks free on one of his two touchdowns last Saturday against Farmington. The second-graders fell 21-18 in their first game of the season. Darion Allen finishes one of his many sacks in Durango’s 26-0 win against Kirtland last Saturday. The third-grade team recorded its second consecutive shutout of the season. 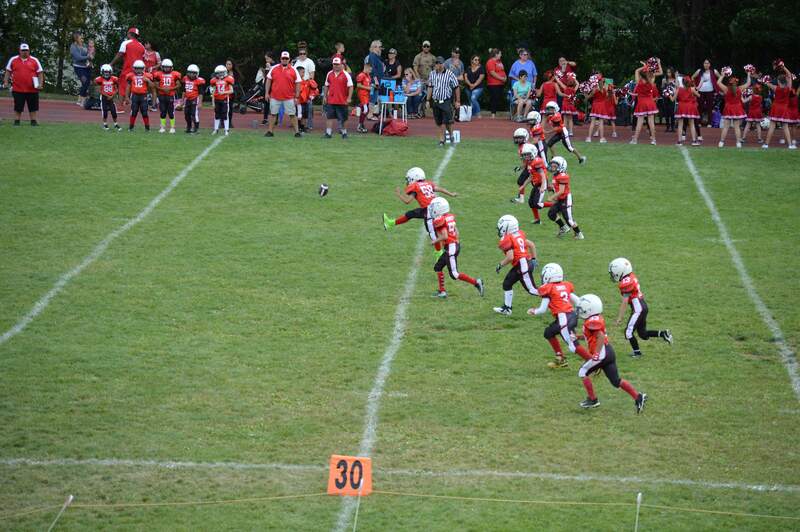 The Durango third-grade team kicks off during a game against Kirtland last Saturday. The Demons will travel to Farmington on Saturday. 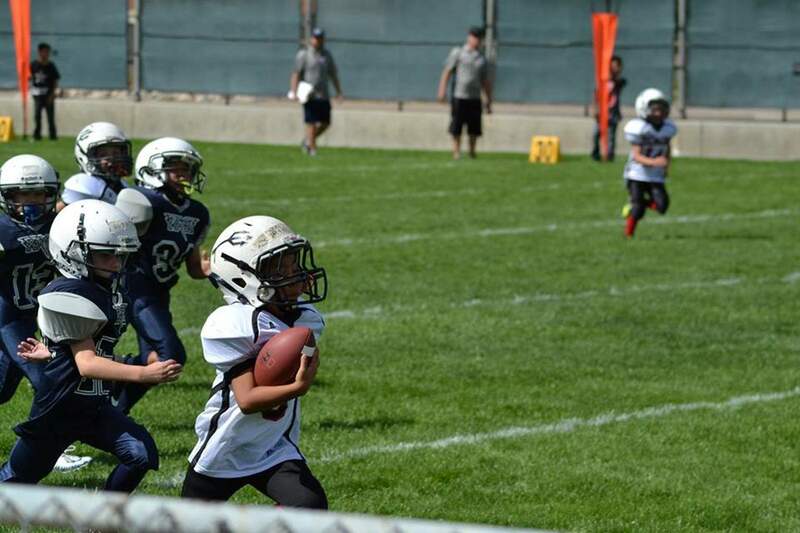 The Durango Young America Football League teams had an impressive weekend with two shutout wins. The fifth-grade Demons defeated Farmington 27-7. Tatum Rose got the scoring going for Durango with a 14-yard touchdown in the first quarter. It was followed by a 1-yard punch-in from Cooper Mitchell, who was helped out by his fellow offensive linemen Ian Rodriguez, Warren Uptain, Dillon Espinosa, JJ Vickers and Lane Lyda. Durango capped off the first half when quarterback Griffin Connolly threw a 33-yard scoring strike to Zane Pontine as the game clock expired. It was a similar story in the second half, as Durango’s defense overwhelmed Farmington and forced numerous turnovers. Durango will take on Bloomfield at 1 p.m. Saturday in Bloomfield. 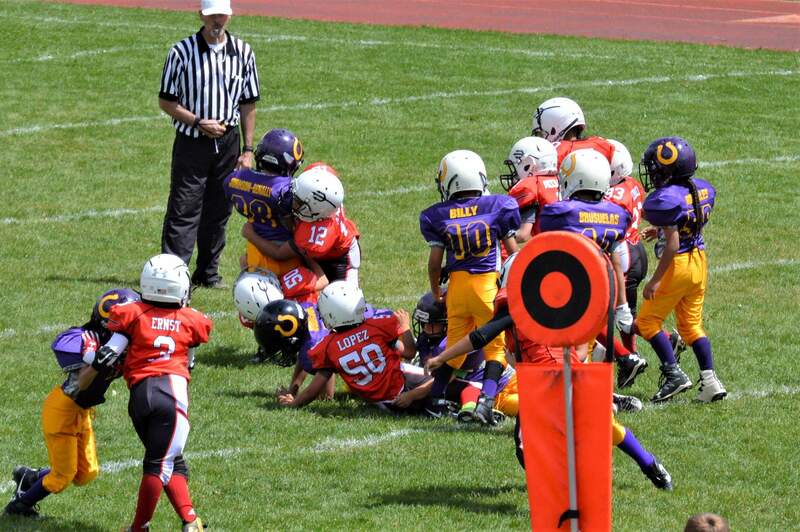 The Demons’ third-grade team had its second consecutive shutout last weekend after a 26-0 win against Kirtland. Jered Lopez found the end zone twice, and Malique Rodriguez and Isaiah McCrady added one score each. On defense, Darion Allen recorded numerous sacks, while McCady and Rodriguez recorded fumble recoveries. The Demons will make the trek to Farmington at 9 a.m. Saturday at Doc Jones field. At the fourth-grade level, the Demons also recorded a shutout, winning 40-0 against Farmington. It was a touchdown party for the Demons, as Blaze Aguilar took off on the first play from scrimmage and scored. Aguilar led the way again with Durango’s next possession with a 22-yard touchdown. The Demons also had touchdown runs from K.J. Reynolds and Keenan Aragon, who scored on a 45-yard scamper. The Demon defense was stout, as it held Farmington to one first down in the game. Grady Feeney led the team with eight tackles and three for a loss along with a fumble recovery. Durango will play Bayfield at 1 p.m. Saturday in Cortez. The second-grade level opened its season Labor Day weekend with a narrow 21-18 loss to Farmington. MJ Keo scored two touchdowns. Isaiah Coteras, Cole Perkins and Caleb Duran led Durango’s defense. The Demons will take on Kirtland in Bloomfield at 9 a.m. Saturday.